Rove Says Allred Adds Credibility – Question: To What Does Rove Add Credibility? I don’t frankly know which is more laughable: Karl Rove’s claim that Gloria Allred’s representation of Sharon Bialek makes her claims more credible. My first question in response to this assertion is: Among whom? I don’t know a single person, apart from leftists, or Karl Rove, who thinks Allred adds credibility. Most people view Allred as a carnival barker, selling side-show attractions on the basis of hyped assertions that are most often subsequently undermined by facts. More, I don’t know who thinks Karl Rove has any credibility on the question of this matter, with respect to Herman Cain. As I’ve asked before in a different context, why should we believe Karl Rove now? Wasn’t it Karl Rove less than a week ago telling us “Cain is finished,” while prognosticating on Fox News? 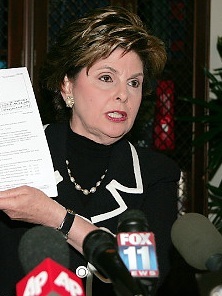 In the days that followed, Cain didn’t decline in the polls as Rove predicted, so now I must ask: What credibility does Karl Rove add to Gloria Allred? “Credibility matters here, and Gloria Allred — while she is a Democrat and a liberal Democrat and openly so — nonetheless, has been involved in a number of high-profile cases like Tiger Woods and others, where the charges have been borne out. Sorry, but this is laughable. If you’ve forgotten last year, when Allred was engaged in another case smearing Meg Whitman, with purely political motives, she was dismantled quite thoroughly first by Mark Levin, and later by Greta Van Susteren. Allred has no credibility, and the fact that Rove now expects you to think she has credibility, while ignoring the plentiful reasons she does not, constitute more reasons why Rove has no credibility. I want to see the statements. Don’t wave statements around, and then withhold them. For all we know, those were an e-mail from your cosmetic surgeon and the evening’s hotel menu. Release the statements! Show us this damning evidence! What are you hiding from us? Why won’t you show us these sworn statements? What is the point of gathering sworn statements that are never to be released? What good are they? How do we know anything about the nature of the statements? These two statements could say “I remember Ms. Bialek being upset at the time.” What would that mean? We know she was at least somewhat upset because she had been “let go” by the her employer just beforehand. We don’t have any clue what is in these allegedly corroborating statements, and until we see them, they constitute nothing except props for Gloria Allred’s traveling stage show. Ms. Allred, you should immediately release these statements or explain why you will not. Your client’s allegations are defamatory, and yet there is no supporting evidence of anything, except for her testimony. I must conclude that you are misleading the American people, and that your concealment of these sworn statements is intended to carry out a hoax. Then, after all of this, we now have the statement of a Tea Party member who says your client wasn’t at the event she says she had attended to speak to Mr. Cain. This is all very curious, and I simply wish to know from Ms. Allred what sort of case she is presenting to the American people. I don’t know what she’s attempting, but until I see these statements she has yet to release, I have no reason to assume this is anything but a pile-on episode in a long history of dubious cases involving Ms. Allred. In the end, if this turns out to be in any measure true, it will destroy Herman Cain, for lying about it, if nothing else. For his part, he and his campaign are denying this flatly. I am going on record here to say that if it turns out that this woman’s testimony is substantially true, Cain has no business being on the ticket, whatever the motivations driving this belated disclosure, but before I am willing to condemn the man, I’m going to need something a good bit more substantial than Gloria Allred standing behind a pile of microphones and before a camera waving “sworn statements” around to which she has not given us access. In short, Ms. Allred has a responsibility to clear this up on behalf of her client, and in the name of justice. If there is anything of substance to these statements, it will doom Mr. Cain’s candidacy as it should, but let’s not assume anything, because Allred has a long history of bluffing. I’m calling her bluff: Release the statements! Let us decide if the testimony alleged to be in them is credible. Cain Accuser: Come Clean Mr. Cain! I honestly don’t know what to make of this, apart from the fact that it is a political attack. I’m going to insist on more information, some sort of corroboration, or something. Do we have hotel receipts? Do we have dates, times, anything to substantiate any of this? My problem with all of this is simple: In the press conference, we were told there would be statements by two contemporaneous witnesses to the alleged victim’s statements in confidence. These statements have yet to be released. It’s one thing to say the statements exist, but it’s something else again to produce them. Something is very odd about this, and the public would be right to withhold judgment pending the disclosure of these statements. Until then, what we have still amounts at best to a “he said-she said,” and it’s not enough to believe the accuser. Over my lifetime, I’ve learned that people can be motivated to make ugly accusations for all manner of reasons, and sometimes it’s because they wish to see justice done. Other times, it’s because they have some other axe to grind with the target, and the problem in this case is that while it’s being presented as the former, we really have no evidence one way or the other. Allred said “Mr Cain, while running for President, is actively lying to Americans.” My question for Allred is this: You say you have corroborating statements from contemporaneous witnesses, but you have not released them. What does Allred offer to substantiate the circumstances? Do we have anything that shows Cain was in Chicago at the time? Do we have anything to substantiate the Bialek was in Chicago at the time? Do we have any information to show that there is or was any relationship of any sort between the two, never mind the allegations put forward by Bialek? At present, I know of no information apart from her statements, and the statements of Allred, and to be honest with you, I don’t consider Allred a credible source for any information. Allred’s comments preceding her client’s statement seem to me akin to that moment in A Few Good Men, when the character played by Demi Moore stands up in court and says “I strenuously object.” The problem is that it’s pointless for Allred to stand up and say Cain “…is actively lying to the American people,” after offering absolutely nothing to corroborate her client’s claims, apart from a business card that shows Bialek did work for the Education Foundation at some point, although by her own admission, not at the time of the alleged incident. Statements of that sort are theater, but they have no impact because there is no evidence to support them. Additionally, we do know that Bialek thought at the time she was let go from the foundation before the alleged incident. It was stated flatly that she thought she had been fired unfairly by the Foundation because she hadn’t raised enough money. Allred states that Bialek is a registered Republican. What does that mean? There are a number of other candidates in the Republican party who will benefit from this disclosure if it sticks. It’s not as though the only people who intend political harm to Cain are Democrats, and in fact, I’ve said that all along. Again, I don’t have a particular dog in this hunt, except to say that I would prefer the truth on all such matters. What Allred has engineered was a very dramatic, hyped, and overblown spectacle from which no usable evidence of misconduct was produced, apart from Bialek’s claims. If the two men who allegedly signed statements corroborating Bialek’s claims will not come forward, or otherwise consent to the release of their statements, then I don’t know how we’re supposed to view this as anything but an unsubstantiated political attack. At the moment, that’s the extent of this despite the endless media coverage. Ladies and gentlemen, we don’t have the truth of this matter yet, and while it’s our natural inclination to believe that where there is smoke, there must also be fire, but the truth is I’ve yet to see any damning evidence. Bialek sounds credible, but then again, many people are good liars, so I have no idea about her actual credibility. Without the release of the statements from her friends that purport to support her story, I haven’t enough evidence to damn Herman Cain. It’s not enough to trot out an alleged victim who makes claims, wave around some pieces of paper that are alleged to contain statements from two confidantes of the alleged victim, and then call it a day. There must be more, or it’s simply another claim brought forward in dramatic fashion by Gloria Allred. Frankly, that says plenty to me about this woman’s motives, because she did not seek out an attorney so much as the media management of a publicist. Foxnews has become the channel I am least interested in watching. Fox News Sunday’s only panelist with any credibility was Juan Williams. Paul Gigot, Evan Bayh, Bill Kristol, and of course, the moderator, Chris Wallace rounded out the show. In summation: two GOP flacks, and three DNC tools. Bill Kristol said flatly that Herman Cain “He’s not going to be the nominee, he was never going to be the nominee.” Paul Gigot, hedging, said Cain “probably won’t get the nomination.” I am so tired of these establishment weanies who are seldom right about anything taking their shots at authentic conservatives. 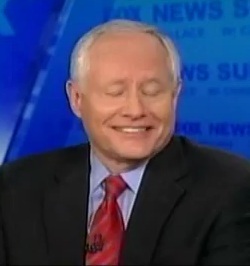 Let’s be honest about it: How did Bill Kristol’s panting, arrogant support of the “Arab Spring” turn out? After spending weeks bashing Glenn Beck who said at the time that we should worry about the direction of events in Egypt, you would think Kristol might learn some humility. It’s not so much that I love Herman Cain as it is that I have come to detest the establishment GOP nearly as much as the hard left of the Democrat party. News cycle after news cycle, event after event, for as long as I can remember, these Republican insiders, these geniuses who tell us which candidates can win, seem to get it wrong until the answer is obvious, and then they backtrack in a cacophony of harrumphing. The basic problem with these elite Republican tools is that none of them share much in common with the bulk of us out here in fly-over country. When they venture out of their narrow corridor of insider politics and Washington DC intrigue, they don’t spend much time getting to know us. It’s a bit like the falsely accused man who retains an attorney who advises his client to “take the deal.” They pretend to know what is in our best interests, and when we revolt against it, effectively saying “no deal,” they pout and become petulant at the impertinence of our claim of innocence on the charges. “Just take the deal,” they implore. “Take Mitt.” For precisely the same reasons that I would never cop a plea on a charge of which I knew I had been innocent, neither will I accept this deal. After all, it’s not all about avoiding jail, as they would argue, but as you and I know, about avoiding the damage to our reputation, seeking justice, and being vindicated by evidence, logic and reason. While we explain in impassioned terms why it is that we cannot support a moderate of any description, they nod, they seem to be listening, but in the end they look at us and explain why “the deal” is better. NO! We did. How did that work out? In 1980, it was no better, but it turned out well. We grumbled, but we elected him on this basis. When he made deals with Democrats and raised taxes, we again rebelled, some of us leaving the party in 1992, in search of other options. This turned out well too, didn’t it? In 1996, the establishment was undeterred and unreformed. Then, in 2000, they offered us another Bush. We fell for this line too. By the end, we wanted Bush gone so badly that had he been eligible for another term, some of us might have voted Obama just to be rid of Bush. Now we come to our current predicament. This conversation is only partially fictional. While these precise words weren’t spoken by a particular agent of the GOP establishment, it’s nevertheless the meaning of what we and they said to one another. Each and every time conservatives have compromised their values and went along with the moderates, the establishment, and the Bush clan(all mostly one and the same,) we have been hammered. Each time. The surrenders, the failures, the endless excuse-making, all so that this crowd of wizards can tell us how to live rather than having Democrats telling us how to live… Why? I submit to my fellow conservatives that we cannot afford another deal. Whomever we select, it cannot be another one of their choosing. Honest to goodness, listening to the chatter on Fox News Sunday, it is getting increasingly difficult to tell the difference between the Republicans and Democrats. One gets the sense that they’ve all spent too much time at the same cocktail parties swilling the same statist kool-aid. I’ve watched every one of the previous debates, and by far, the Lincoln-Douglas style debate at the Woodlands near Houston Texas, hosted by a Tea Party group, the Texas Patriots PAC, has been my favorite. Both men were collegial, serious, and very honest about some very difficult issues including entitlement reform. It’s a stunning difference when contrasted against the previous debates with seven, eight or nine candidates crowding a stage, and effectively permitting the media to highlight its favorites, or the controversies of the moment, turning the events into spectacles rather than serious debates. It was also refreshing to have a moderator, Ben Streusand, who was not a leftist and whose interest was in furthering the debate and informing the public. This debate was such a thoroughly refreshing improvement over all the other debates that the candidates ought to adopt this format and ditch the rest. I think both men performed admirably, and I also believe that while I could tell you who I think “won” the debate, it’s also important to note that winning and losing wasn’t the focus. Neither candidate seemed to be pushing for some knock-out blow of the other, and I think that was in part due to the format, but also a result of the serious but friendly competition between these two men. I think both men are to be commended for their performance, irrespective of who one believes to be the victor, and I think the Tea Party group that hosted this debate is to be praised incessantly for putting this together and making it a success. The primary beneficiaries of this debate will have been the American people who bothered to watch it, and it was great television. As with any such event, both men had their laugh lines, but more importantly, both men seemed at ease in themselves and with one another. I now have a far better understanding of what both men propose, and I also have a much deeper respect for the thoughtfulness of both men. Gingrich stood up for the idea that the so-called “Social Security Trust Fund” is real, and is a debt owed by the government to retirees and current workers who have paid into it. Cain said that reform wouldn’t be possible without considering new options, and also reforming the way we generate revenue. Both men argued passionately that individual choice must be an inherent property of any “fix” to Social Security. In short, whatever your particular preferences, both men said that individual liberty is the key to successful reform. They are absolutely correct. Neither man spared their contempt for the current administration, although Gingrich was probably the more direct of the two in his criticisms. Both men believe our current system of revenue is broken, and both have their own respective proposals that were at least mentioned during the debate. I think that it’s clear that among the conservatives still in this race, these two are the best choices, in the main because they seem quite suited to a serious conversation about what the nature of our solutions must be. I wouldn’t be unhappy if these two comprised the ticket for Republicans in 2012, particularly given our other choices at the moment. I hope the other candidates will have watched this debate and realized why this is the better format, and work with Tea Party groups to set up similar events while ditching the remainder of the big media spectacles. There’s simply no reason to subject our candidates to the liberal moderators, the idiotic questions, the “gotcha format,” and the rigid and plastic format that has been at the heart of the other debates. I would encourage Tea Party groups to put on similar events all over the country, changing up candidate pairings so that you can examine them two at one time, thus clearing up things for voters. I think that would have a wonderful effect on voters’ ability to choose with clear-headed decisions about issues in this accelerated primary season. Update: You can participate in this Hot-Air Poll too! This entire debacle is garbage. Everybody propagating it is full of garbage. Frankly, it’s nonsense, and it’s empty and plainly a hit-job. Through all of this, we still have no first-hand accounts, no facts, and no evidence of any kind. We have nothing except allegations, the disclosure that settlements occurred (which is not an admission of guilt,) and scant little else. The Politico hacks who broke this story have nothing of substance. Somebody dumped the story in their laps, and they went out to brow-beat people into giving information. They asked accusatory questions with the air of insider knowledge, and probably bluffed their way into some answers on their way to attempting to lynch Herman Cain. Let me make this clear: Cain is most certainly undergoing a “high tech lynching,” and whatever the facts may turn out to be, the truth is the media is convicting him without any of them. They know it too, and that explains the drumbeat for more disclosures from the National Restaurant Association. It’s garbage, every bit of it, but this lynching isn’t happening because Cain is black, but instead because he’s conservative. Let me say this again: The whole episode has nothing to do with his race, but everything to do with his being a conservative politician. Jess Jackson never faced this despite the whole litany of sexual misconduct charges and allegations of illicit affairs he has faced over the years. Charlie Rangel committed actual crimes while serving in elected office, and he never faced this. We can list any number of people of color who have had similar or worse charged leveled at them with much more overpowering evidence, which in this case, means “any evidence at all,” and yet none of them faced this sort of ugly assault by the media. Clarence Thomas? Well, but he is a conservative, appointed to the high court by a Republican president. Understand, however, that it’s not race that is the deciding factor. 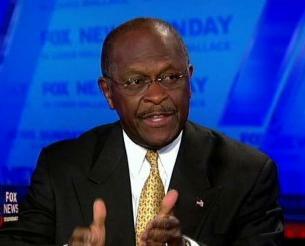 Herman Cain is a conservative. The fact that he is a black man only sweetens the pot for the race baiters and hustlers of the left, who deny that a person can be both black, and conservative; hispanic and conservative; female and conservative; gay and conservative; atheist and conservative. You see, they have traditionally held sway with these groups, and the notion that those groups might in any measure defect makes it implausible that leftists would ignore it, but more importantly, impossible for the GOP establishment to demur. You see, whatever eventually turns out to be the case about these allegations, all we can say with certainty right now is that there’s really no evidence Cain ever did anything wrong and/or improper. What all of this is intended to do is create an impression and to damage Cain. The left certainly doesn’t give a damn about facts, and never has. The establishment Republicans don’t care about facts at all. 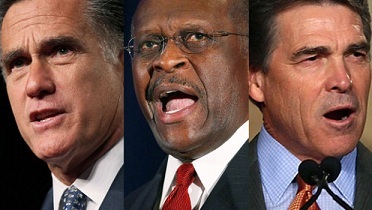 Both groups see another opportunity to kill off Cain’s candidacy. Both groups intend to exploit this. Both groups hate conservatives. This is why Karl Rove appears on FoxNews, telling viewers “Cain is done.” It’s not that Cain is black that motivates Rove or his kindred spirits in the GOP establishment. They’d nominate anybody who would serve their immediate and long term interests, but they cannot permit a conservative of any description who isn’t in their club to win the nomination or serve in any leadership capacity. Until we have damning evidence in hand from named sources, with first-hand testimony, and actual evidence of some sort, I think we would be prudent to focus on the second because if the first turns out to be the long and short of it – that this entire episode is concocted, inflated, hyped garbage – we need to know who the scoundrels behind these disclosures are, because they are a toxic part of our national political problem. Could this have originated with the left? Sure, but I find that less plausible, if only because of the people involved. The left is a bunch of opportunistic vultures, and they are particularly lazy as journalists. No, somebody delivered this story to the hacks at Politico, and my money still bets the source is somebody in the Republican establishment. As this entire show goes on, one man is escaping examination and vetting, and with the early states rushing ahead, he may escape any vetting at all while we pursue this story about Cain that has no real evidence, no substance, and as yet, not so much as a first-hand statement from any party to the alleged settlements. Nobody is asking Romney about Romneycare. Nobody is talking about his wheels-for-welfare program in Massachusetts. Nobody is examining the vices or virtues of Perry’s tax notions. Nobody is looking at any issue of importance, and all the while, Romney hopes to sneak in by running out the clock. To hell with that. I have told you before, and I meant it, and I’ll say it again: I’m in favor of ABAR. That’s “Anybody But A RINO.” If my state’s primary arrives and the leading two choices are Romney and somebody else, I will vote for that somebody else, unless it’s another RINO, in which case, I’ll vote for the highest-polling conservative on the ballot. If a RINO wins the nomination, I will withhold a vote for President in 2012, and I will work for local, congressional, and state-wide conservatives, and even real conservatives in other states. If you say to me, “But Mark, then Obama will win,” I will say simply that you permitted it by nominating somebody other than a conservative. This time, you squishy Republicans and RINOs are going to compromise with us, and if you don’t, you’ll lose. 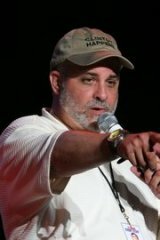 So I’m turning it around on you right now: I’m telling you mush “Repubics” who would nominate another slack-jawed moderate: I will not support them, and I believe many conservatives are prepared to join me, because they’re as concerned about the future of conservatism as they are about the country, because they realize, as do I, that you will not save the latter without the former. You don’t like it? Tough. Feel free to read a blog written by a surrender-monkey. You want mush? Go elsewhere. Neither has it been a secret that Cain isn’t my first choice, nor is it a secret that I’m still undecided about who to support in the absence of my first choice. What is certain is this: I will not support, by any means, under any consideration, the candidacies of Romney, Huntsman, or Paul. Had he run, I would not have supported Christie. I would not have supported Mitch Daniels. I will never support another Bush, so you can forget that “Go Jeb” business. I’d sooner hack off my arms than to let them mark a ballot for another Bush. I won’t consider somebody whose name is coincidentally “Shub” because it’s too close to “Bush” for my comfort. No thanks. That clan has done two generations of damage to the good name of Conservatism. Enjoy your lynching of Herman Cain. Absent verified evidence and/or testimony, you’ll have to do it without me. It’s disgusting and filthy and until there’s some evidence, every rational person ought to consider this to be pure garbage. I’ve seen enough of these lynchings of Conservatives, and I’ll have no part of it. You GOP establishment types can huddle with leftists at the cocktail parties inside the Beltway, and while you do, we’ll lose the country. You think you’re buying safety from the leftist mobs, but you’re the first people who will be fed to them upon silver platters. If you want to sacrifice Cain on the altar of the left, have at it. Barring any useful, meaningful, verified and factual evidence and testimony to support all these vacuous allegations, I will absolutely support Herman Cain in lieu of a better choice, but I will not under any circumstance support the GOP establishment’s choices. Deal with it. I don’t wish to seem too indignant, but why is the Cain campaign now accusing Perry’s campaign of outing this story about sexual harassment allegations and settlements about Cain? It’s not that Perry’s campaign wouldn’t have any motive, but I’m going to need to see more evidence, just as I’ll need to see more evidence on the allegations about Cain before forming any judgments. Earlier in the day, there was an equally plausible story about Cain’s successor at the National Restaurant Association, now a Romney supporter, who may have been in a position to have known some details about the Cain story, and then it was revealed that Karl Rove and Karen Hughes had connections with the same fellow, Chris Wilson, the pollster who was interviewed on KVOT in Oklahoma and said several things about the Cain allegations. Why, with all of this, would Herman Cain’s campaign leap out there and make these accusations against Perry’s camp? Do they have any more evidence to which we are not privileged? Or is it something else? You folks know by now that I am a bit cynical about all of this, and that my own speculations are based on reading the same information widely available to everyone, but what you expect is that I will consider things from a different perspective, and I have done so knowing I am challenging conventional wisdom at times, but that in lieu of evidence to the contrary, we ought to consider all the possibilities. Some wondered early on if Herman Cain’s campaign was a shell operation because there is so little organization or firm foundation there. Dana Milbank seems certain that his campaign was never supposed to go anywhere, as she absolutely rips him in the Washington Post. Cain at times has seem ill-prepared for questions, and at times his answers have been unfocused, vague, and self-contradictory. Cain was the immediate beneficiary of Christie and Palin bowing out, and none other than Rick Perry was passing his peak in the polls as Cain started briskly upward. Honestly, I’ve had some doubts about Herman Cain, and they are born of an observation about his campaign, and his preparedness. At times, I haven’t been alone in wondering if he wasn’t simply trying to secure the VP slot. It’s entirely possible that I have misread Cain, as he is genuinely likable and seems a good-hearted man, but his tendency at times to align with Romney have left me to wonder how serious about the presidency he has been. Some have suggested that he knew all along these allegations would be coming, and ought to have known they could wreck his campaign. I don’t know about that, but what I do know is this: An allegation of the sort Cain’s campaign is now making against Perry could be the fatal blow that sends Perry home to Texas, whether founded in facts or not. For their part, the Perry campaign is flatly denying the charge. The association lobbies for the restaurant and foodservice industry and represents the industry on Capitol Hill. It was the largest food and beverage political action committee contributor to both the U.S. Democratic and Republican Parties in the 2004 election cycle. Now that puts a little different light on the subject, and a little different light on Mr. Cain, the “outsider,” doesn’t it? That’s sounds vaguely like it could be a part of that whole beltway-insider system we keep hearing about. It would be apparent to the various GOP establishment operatives that they would have to defend Romney from the outset if they were going to get their chosen candidate across the finish line. They must have known that Romney’s RINO skin would begin to show through the paper-thin conservative veneer with which they had covered him. How better to defend him by preventing him from having to do battle at all? As Machiavelli might have observed, what better way to be sure your candidate prevails than to control all the candidates? For the record, I’m not suggesting that all of these candidates are merely establishment shills, in this campaign only to set things up for Romney or anybody else, but let’s at least be honest in that most of these people do the same cocktail party circuits, know most of the same people, employ the same law firms, lobbying companies, and public relations outfits. In short, they all speak a different language and have different points of reference from most of us wee folk out here in fly-over country. It’s the reason why for most of them, it’s impossible to listen to the claim of being “an outsider” while maintaining a straight face. 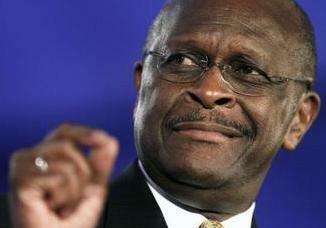 Herman Cain’s successor at the National Restaurant Association is a Romney donor. Chris Wilson, the pollster who was on the radio today, worked for Karl Rove and the National Restaurant Association, along with many others, but only recently, for a PAC associated with Perry. If you go through all of these candidates and compare their lists of donors, contributors, volunteers, lawyers, pollsters, and PR flacks, you’ll find that over time, there have been all sorts of overlapping relationships and linkages. This is the ugly truth of how the game has been played all these years, and it points out the intractable problem with the desire among so many to “clean up Washington:” To untangle this spaghetti of associations, connections and relationships is nearly impossible. When Herman Cain’s campaign comes out with this flimsy link to a pollster who has only recently begun work for a Perry PAC, you must realize that they’re trying to sink Perry, but if they have no more evidence than this, I’d suggest as much or more caution as I had suggested earlier Wednesday. On the other hand, Perry’s campaign might be behind this, but the sense I’m getting from the reports of the Cain campaign’s charge is that it has less foundation in fact and substance than the already pathetically flimsy allegations Politico published about Cain, and that should give you pause. Why would his campaign leap to this accusation, particularly on such a flimsy basis? Do they have more evidence? Do they have something concrete tying this to Perry? I’m no Perry fan, and no I wouldn’t be surprised, but let’s just say that something about the way this charge against Perry’s campaign came together makes me wonder. Is There Another Connection to the Cain Story? Chris Wilson (born October 24, 1968 in Lawton, Oklahoma) is a Republican American pollster and political strategist who has conducted hundreds of public opinion studies for over 100 of the Fortune 500, influential associations, foundations, elected leaders of the U.S. Senate, U.S. House of Representatives and state governments. Wilson served as Executive Director of the Republican Party of Texas when President George W. Bush was governor, working directly for Karl Rove, and following Karen Hughes when she left the Party to join the campaign. This is very curious, to say the least. As people continue to investigate this story, it will be intriguing to see what will be discovered as more rocks are overturned. Cain Sabotaged by Fellow Republican? Sabotaged by a Fellow Republican? Robert Stacy McCain’s blog sidekick “Smitty”(theothermccain.com) is reporting that one of Romney’s donors is the successor to Hermain Cain as CEO and President of the National Restaurant Association. McCain links to another site, Virginia Virtucom, for the meat of the story, as McCain himself cautions readers not to be in too great a hurry to connect the dots. At the same time, Limbaugh discussed the allegation near the end of the first hour of Wednesday’s show. As I explained in my analysis of the Cain allegations story and the way it was broken, I have always suspected that this was an attack launched from within the bowels of some other Republican candidate’s campaign. While it’s much too early to know anything with certainty, it does look a bit interesting, but as theothermccain.com cautions, maybe not. After all, these people all travel in the same circles of power and influence, and it may be entirely coincidental. Nevertheless, in examining FEC records, the person in question seems to have contributed to only two of these Republican candidates: Mitt Romney, and Herman Cain. Some would ask if he was out to damage Cain, why he would contribute to the Cain campaign, but that could simply be cover. The truth is that we may never know how this story was broken, and who tipped off Politico, but I still strongly suspect a trail will lead to some Republican insider, although whether it winds up being Cain’s successor is a matter of some doubt. There’s simply not enough evidence to make this claim, or as Smitty says, “connect the dots,” but Virginia Virtucom is insisting they’re closing in on the originator of the disclosure to Politico, and Northern Virginia Lawyer isn’t backing down from the story. This is what turns off so many people to politics. If it turns out that a campaign or its surrogate(s) are tied to these allegations or their disclosure, you can bet that there is going to be hell to pay for that campaign. Whomever did this, there are a number of people pursuing it, and in the end, it will be found out. I would caution readers not to assume this is the individual who disclosed all of this to Politico. It might well be somebody else, and there’s simply not enough data to prove it, so like Smitty, I’d say you shouldn’t rush to assume connections and relationships that may not be real. Nevertheless, it’s an interesting development, as the blogosphere scrambles to find out who dropped this story in Politico’s lap. It’s time to get real. George W. Bush isn’t president any longer. Irrespective of what Bush and his political operatives would like, the Bush family does not control the Republican party, and particularly conservatives. They may control the party apparatus, and its clear that Karl Rove is still involved in shaping the establishment narrative. Thus far this election season, Rove has told us why various Republicans are unworthy, and why various Republicans “can’t win,” but what Rove leaves unstated is how he’s operating on behalf of certain patrons. Appearing on Fox News with is handy little white-board, Rove has become a spectacle of establishment manipulation, but his problem is that nobody is falling for it any longer. 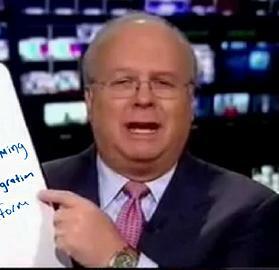 We know who Karl Rove is, and what he’s after, and we have a pretty fair idea which interests he represents. I’m not interested in what Karl Rove thinks, or what he’s pushing this week. AWR Hawkins at BigGovernment.com takes on Rove’s claim that Cain is done, and Levin discussed the article. At the very least, it’s clear to me that the division within the Republican party really comes down to the establishment that still caters to the Bush crowd, and the conservative wing of the party, and this divide is rearing its head again in the current attacks on Herman Cain. I think conservatives may be so tired of the establishment script that they may simply ignore Rove’s pronouncement of the death of Cain’s candidacy. After all, who the hell is Karl Rove? I believe the conservative wing of the party is so disgusted with this well-timed attack on Cain that they may suspect, as I do, that this story about Cain has been generated not by the left, but as a hit-job in the Republican party. Time will tell, but it’s hard to ignore this repeated trend. The "Not Ready for Primetime" Players? As you know, I don’t support Rick Perry for a whole host of reasons, particularly having been a Texan throughout the time he’s held state-wide office, and knowing he’s got a number of really ugly crony-capitalist skeletons in his closet. With that in mind, I must say that this story about the hunting lease, and the rock with a racial epithet stinks to high heaven. I realize that a hint of racism would disqualify a candidate from consideration, and well it should, but to extend this story to impute some racist motives on the part of Rick Perry is simply going too far, and is mere race-baiting nonsense. Perry has done himself enough damage with his poor debate performances, but what I found stunning in the aftermath of the Washington Post story on this greatly overstated controversy about Perry was that Herman Cain exploited it to make an attack on Perry, by calling the instance “racially insensitive.” He later walked that back once the full context became known, but his reflex to run with that sort of inflammatory story has caused me to question the temperament of Cain more than Perry. The only thing perhaps more disgusting was the fact that even after the story had begun to lose some of its initial traction, Romney’s camp pounced once they thought it was safe. Like you, I believe every one of these candidates should be thoroughly vetted, but I think we’re coming to the point in American politics where the “Gotcha” business that Newt Gingrich has lamented is getting out of hand. Rather than focus on the real shortcomings of the candidates, we’re off on these over-hyped tangents. This display of wretched gutter politics makes me question the lot of them. When it boils right down to it, none of them are really exhibiting the character I expect from a president. 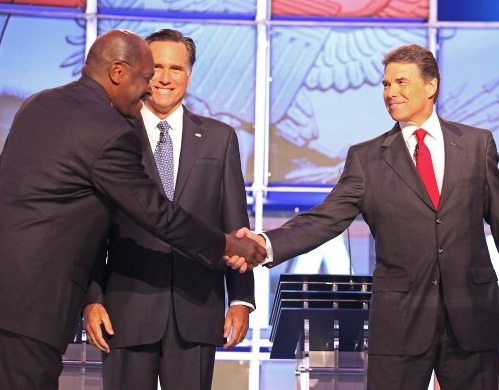 Perry has a whole host of problems on a substantial basis of facts, as does Romney, and as I’ve been learning more recently, Herman Cain as well. The problem is that when you see them pile onto a story like this, you know it’s not about substance. It’s about scoring “Gotcha” points. 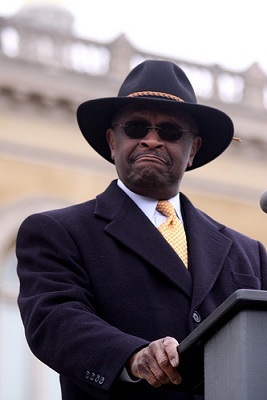 For Herman Cain to now sink to the level of playing the race card, after already having accusations of racism thrown at him over his remarks about “brainwashed blacks” is a matter of a serious failure in judgment. Romney ought to know better, but he’s apparently happy to stand back and let others make the first attacks and then stick his two cents in and kick his opponent once he’s already on the ground. That sort of cowardly play is just what you’d expect from a candidate who seems to seek victory by default. All in all, it’s a pretty sorry state of affairs. Here we have nine candidates in the race, and they seem muddled and dominated by the media narratives of the day, and that may be the saddest declaration about this field one can make: None of them seem fit. More fit than Obama? Yes, perhaps that’s the case, but are any of these really the people we want to lead(not run) this country? While the jury is still out on the question, I believe it’s become time for we voters to being answering it. It’s astonishing that at this late date, what we now seem to have is a group of people engaged in a fight to avoid the worst “Gotcha” moments, but apart from some platitudes, and a horrible lack of policy details, I’ve yet to see anything particularly compelling from any of them, and none of their records offer much solace. They all need more vetting, and as they become the front-runner, or challenge the front-runner, one after the other, we need to examine their records and their history in office and in business. Issues like this Perry story are simply concocted nonsense in an attempt to drive the election according to a media narrative. If we’re to select a candidate, that candidate should have an impeccable record in office, and we must do our best to avoid this sort of tabloid journalism. It simply doesn’t serve the electorate, and while it can create many nifty headlines and soundbites, it doesn’t do anything to take us in the direction of restoring our country. I can think of thirty reasons not to support Perry, but none of them have anything to do with some painted-over, turned-over rock on a hunting lease in West Texas of which Governor Perry may have once been aware as an artifact of a terrible, but thankfully bygone era. As expected, the spectacle at center stage between Perry and Romney bickering over their respective interpretations of their books became a recurrent theme. Perry took the first real shots at Romney, looking much too aggressive, and coming across as too eager to hammer his opponent. Romney battled back, but as a Texan, I became embarrassed for my Governor. He looked confused at times, and ill-prepared. 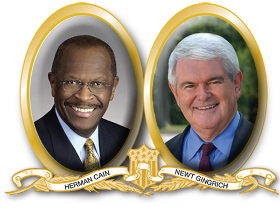 By contrast, the stars of the show were Herman Cain and Newt Gingrich, the first revealing his fight with stage four colon and liver cancer, and expressing his strong support for Israel, and his 9-9-9 plan, with Gingrich providing the real wit in the crowd. Bachmann was flat, while Romney was wooden. The rest was fairly standard. Aside from Cain and Gingrich, the remainder of the field sounded tired. 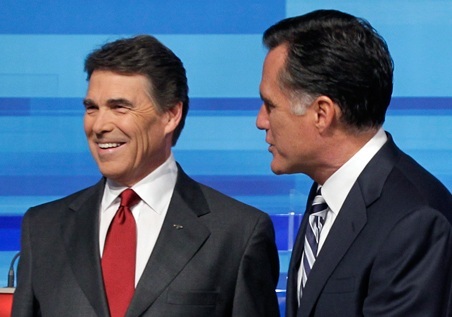 Romney’s rhetoric was particularly flat, and Perry came out too aggressively, and sounded confused by the end. He has shown in two successive debates that he has a problem holding himself together for more than an hour. Perry’s worst moment may have come when he seemed to double down on his compassion argument for the in-state tuition to illegal immigrants. That was astonishing and drew some extended booing from the crowd. This field needs something that’s missing. I have my own ideas. What are yours?